Fr. Michael is on his annual [silent] spiritual retreat in Glasgow this week - please pray for him. If you need a priest in an emergency, please contact the priests at Warwick Square - 521509. Next Month we have two ‘Faith on Tap’ talks: on 5th November we welcome Bishop John Keenan and then on 19th November we welcome Fr. Marcus Holden. Until October 25th our weekly collections after mass will be jointly in aid of Syrian refugees and the Calais refugee camp. In addition to this, we will also be collecting food and clothing to pass on to Calais Action Carlisle. For further information contact Elisabeth, Kathleen or Richard ( 544737 ). After October 25th, we will begin our usual food parcel collection to pass on to local families at Christmas. Please use the box at the back of church as usual. A table will be set up at the back of church this Sunday to enable Parishioners at St. Margaret Mary to pick up a shoe box and put in warm clothing, toiletries “Male and Female”, Scarfs & Gloves etc. Please see Elisabeth, Maria or Alison for further details. In honour of the feast of St. Margaret Mary and following on from the success of the Christ the King 60th one - there will be a shared lunch this Sunday from 1.00 pm in the Parish Centre at St. Margaret Mary’s - please come along. On Wednesday mornings from 9.15 am at St. Margaret Mary School. This course resumes on Tuesday 13th October at 7.30 pm at Christ the King. All welcome. Many thanks for your offering of £794.98 last weekend. There were 280 at church over the weekend. If you are interested or know someone who is interested in becoming a Roman Catholic, an informal group will be formed after half term in October to explore the richness of the Catholic Faith. Contact Fr. Michael for more details or just for a chat. Bilingual prayer books are available in both churches for use during the celebration of Holy Mass - in Polish, Spanish and Portuguese. Charity HOST is seeking friendly people who could volunteer to offer an invitation to adult international students for a day, weekend, or for four days at Christmas. Learn about other cultures, welcome a guest far from home, and make the world a little friendlier! To be put in touch with your local organiser, visit www.hostuk.org or call 020 7739 6292. In this Year of Priestly Vocations in the diocese, please pray daily for this intention [using the Diocesan Prayer Card or the prayer found on the front of this newsletter] and consider attending the Eucharistic Holy Hour held in each church of the parish every week. We are asking for Your support to pray for a change of heart for the men and women of violence in Syria and for their victims. There will be adoration between 6.00 pm and 7.00 pm in Christ the King Church every Monday. We hope you can spare some time to join us. Sr Gerald & Sr. Maureen. 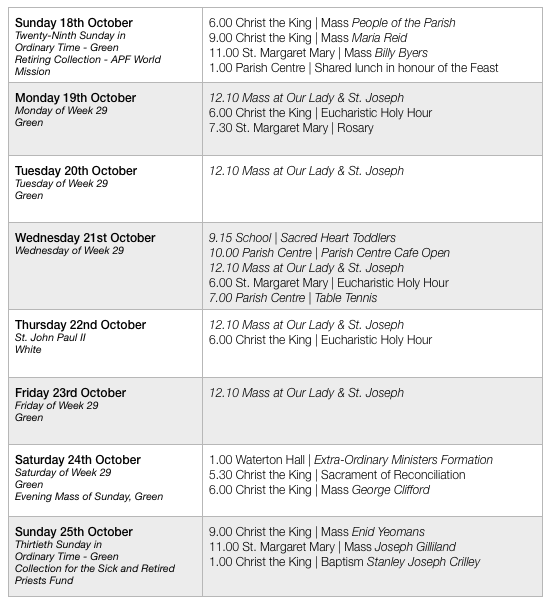 There will be a formation day at Our Lady & St. Joseph’s on Saturday 24th October 2015 beginning at 1.00 pm led by Fr. John Millar. Could all extra-ordinary ministers please attend. Cost is £5 on the day to cover expenses. Volunteers throughout Carlisle and District are urgently needed to support a large range of different local organisations. Cumbria CVS in partnership with Carlisle Youth Zone have organised a Volunteering Fair on Wednesday, 21 October from 5.00 pm - 7.00 pm at Carlisle Youth Zone, Victoria Place, Carlisle. If you are interested in volunteering, please come along to find out more. Casterigg Manor, Keswick, 11-13 December. An inspiring weekend away from home and school for Year 10+ and above. Join in, make new friends, enjoy the hospitality of the Manor and prepare for Christmas. For more information, please call 01768-772711 or email: team@castleriggmanor.co.uk. Renewed in the Holy Spirit is the theme of a day of renewal led by Fr Martin Onouha, St Clare’s parish hall, Sharoe Green Lane, Preston PR2 9HH; Saturday 31 October, 10.00 am - 4.00 pm. Contact Bernard Loveland, on 015395-63391 for further information. 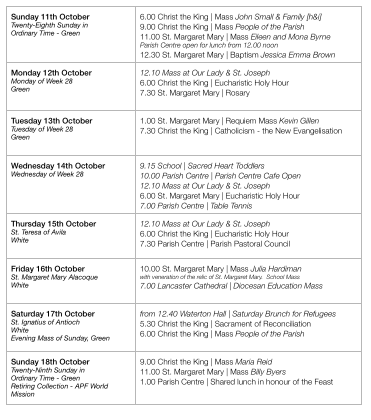 Please make a note of the Mass schedule this week - there are a number of changes. Mass will not be celebrated in the parish on Monday, Wednesday and Thursday. Mass on Friday is a whole school Mass for the Feast of St. Margaret Mary. Join us in a Saturday Brunch at Waterton Hall, Warwick Square, on Saturday 17th October from 12.40 pm (after 12.10 pm Mass). There will be a Tombola, Cake Stall, Raffle and other attractions. This event is being organised by The Extended Family of RSHM (St Gabriel’s Sisters). Any donations of good quality Tombola or Raffle prizes would be gratefully received. Please contact 01228 562756 for further details or to arrange collection of donations. A table will be set up at the back of church this Sunday to enable Parishioners at St. Margaret Mary to pick up a shoe box and put in warm clothing, toiletries “Male and Female”, Scarfs & Gloves etc. See Elisabeth, Maria or Alison for further details. In honour of the feast of St. Margaret Mary and following on from the success of the Christ the King 60th one - there will be a shared lunch from 1.00 pm on Sunday 18th October in the Parish Centre. Please sign up with offers of food on the sheets provided. Many thanks for your offering of £727.35 last weekend. There were 302 at church over the weekend. We’re looking for willing volunteers to join the flower arranging team at Christ the King. If you’re interested, please have a word with Fr. Michael. There is a collection this weekend at Christ the King to cover expenses for flowers. The Bishop invites all who are involved in teaching (in the Catholic or State sector), Liturgy with Children, preparation for First Holy Communion, etc, to gather with him for a votive Mass of the Holy Spirit, in the cathedral, Lancaster LA1 3BT, on Friday 16 October, at 7.00 pm, to ask God’s blessing on the new year of teaching and formation. Charity HOST is seeking friendly people who could volunteer to offer an invitation to adult international students for a day, weekend or four days at Christmas. Learn about other cultures, welcome a guest far from home and make the world a little friendlier! To be put in touch with your local organiser, visit www.hostuk.org or call 020 7739 6292. Fr. Michael will be absent from the parish from 19th October for his annual spiritual retreat. Please renew your love for this devotion by praying the rosary during the month of October. Rosary beads are available from Fr. Michael if you are in need of any. We are asking for Your support to pray for a change of heart for the men and women of violence in Syria and for their victims. There will be adoration between 6.00 and 7.00 pm in Christ the King Church every Monday. Hope you can spare some time to join us. Sr Gerald & Sr. Maureen. Meets on Thursday evening at 7.30 pm in the Committee Room of the Parish Centre.